Lake whitefish are available fresh and frozen whole, in fillets, and as steaks. Value-added lake whitefish are sold as roe or smoked, either head-on or in fillets. When raw, the flesh will be nearly pure white and then turns off-white when cooked. Lake whitefish have high fat content and a mild flavor with medium-firm meat that has large flakes. The high fat content makes this fish ideal for smoking. When sourcing lake whitefish, both the lake and the specific state/province information is important to note. Lake whitefish are a slender, elongated species with a nose that protrudes over their mouth. They are silver with a light green-brown back. Their tail is deeply forked and they have an adipose fin that helps stabilize the fish while swimming. Their fins are white and their tail is dark along its edges. Lake whitefish usually grow to about 1.5 to two feet in length and can weigh up to four pounds. The maximum recorded age of a lake whitefish is 50 years, but most individuals have a lifespan of around 25 years. Lake whitefish become sexually mature at around four to seven years of age. They breed once a year; spawning in the late fall into December when water falls below 45 degrees Fahrenheit (seven degrees Celsius). Spawning usually occurs close to the shore or around islands. During spawning, females will release 10,000-130,000 eggs (depending on their size) and males will simultaneously release their sperm into the water. The fertilized eggs will fall to the bottom of the lake and settle there – hatching in early spring. Juvenile lake whitefish feed on zooplankton and begin to eat insect larvae as they grow. Adult whitefish will eat amphipods, clams, snails, shrimp, larvae, and small fish. Small lake whitefish are preyed upon by lake trout, salmon, northern pike, walleye, and burbot. Invasive sea lampreys are one of their main predators as adults. Lake whitefish are widely distributed in North America – ranging throughout northern New England, the Great Lakes, and westward to British Columbia, the Yukon, and Alaska. They have also been introduced to Montana, Idaho, and Washington State. Lake Whitefish are benthic and occupy deep, cold, well-oxygenated lakes and large rivers. They can occupy depths of up to 200 feet (61 meters) and have also been known to enter brackish water. Generally found in schools, lake whitefish spawn in the late fall in shallow waters less than 25 feet deep (eight meters) over rocky and sandy bottoms. Current research led by Michigan State University and Michigan Sea Grant is focused on how climate factors can influence recruitment of lake whitefish and how commercial fisheries can adapt to climate change. Climate change is expected to raise the surface temperatures of the Great Lakes with warmer spring waters potentially increasing plankton productivity and providing greater food availability for lake whitefish larvae – which could lead to higher survival rates. On the other hand, increases in fall temperatures could result in increased storm events and less ice cover that may inhibit the egg survival of lake whitefish. As the Great Lakes encompass two countries, multiple states, one province, and a number of tribal lands, management of lake whitefish is complex. To address coordination and shared management of the resource, the United States, and Canadian governments formed the Great Lakes Fishery Commission (GLFC) in 1954. The GLFC consist of four Canadian and four American commissioners who are appointed by their governments and supported by a secretariat in Ann Arbor, Michigan. In 1981, the GLFC enacted the non-binding Joint Strategic Plan for Management of Great Lakes Fisheries that has been subsequently reviewed in 1986 and amended in 1997 in an effort to better coordinate fishery and environmental management issues in the Great Lakes. Within the GLFC, each Great Lake has its own Lake Committee that is made up of state, provincial, and tribal representatives of the actual fishery management bodies for that lake (with additional support by various federal agencies). The GLFC and Lake Committees are not responsible for day-to-day fishery management, but rather serve as a platform to bring together multiple agencies involved in Great Lakes fisheries to better coordinate research, enforcement, stocking, quotas, and to address other fishery issues. Lake Committees were first established by the GLFC in 1965 as the mechanism for individual agencies to share information; however, it was only after the 1981 Joint Strategic Plan that these Committees became tasked with establishing fishery management goals (called Fish Community Objectives) for each lake and to set agreed-upon yearly harvest levels. They also produce a “state-of-the-lake” report every five years to summarize fishery trends and status. Lake Committees are supported by Technical Committees, which conduct stock assessments and collect fishery data, interpret science, and then make management recommendations to the Lake Committee. Any management objectives that the Lake Committees agree-upon are implemented and managed by the individual state, provincial, or tribal agencies – usually by that state’s Department of Natural Resources (DNRs). These agencies are ultimately responsible for the day-to-day management of the fishery and are responsible for issuing fishing licenses, determining harvest levels, as well as for carrying out other management actions such as establishing size, gear, and area restrictions. DNRs, as well as federal agencies like the US Coast Guard, carry out on-water and on-dock inspections and enforce management measures. Lake whitefish are a freshwater fish related to salmon and trout that come from the Great Lakes in the United States and Canada. 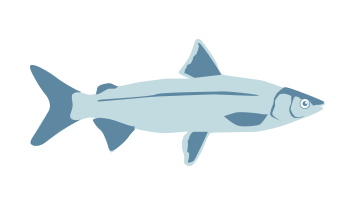 During the first half of the 20th century, whitefish were in decline from industrial pressure, habitat loss, contamination, and overfishing. Management measures introduced in the 1950s expanded over time and, as a result, Great Lakes whitefish have mostly recovered. However, Seafood Watch gave whitefish in Lake Superior in Wisconsin an “avoid” rating due to lack of commercial harvest information as well as data suggesting that stock may be declining. The Lake Erie fishery received a high concern rating for abundance because independent surveys indicated that recruitment rates appear low. Whitefish populations in eastern Lake Superior have been declining due to overfishing and Seafood Watch reported that unlicensed fishing is happening in this area. Whitefish are caught with trap nets and bottom gillnets throughout the Great Lakes. Lake bottoms have soft substrates consisting of sand, silt and muck. The impact of trapnets on the areas where they are used is considered negligible. Bottom gillnets also have a low impact limited to anchors that cause minimal amounts of scouring during setting and hauling, Seafood Watch reported. Generally the impacts of bycatch in Great Lakes whitefish fisheries are considered low due to the placement of gear and size restrictions on it. Lake sturgeon landings are prohibited because of their status as endangered or threatened in the Great Lakes. Although some do get caught unintentionally in gillnets used to target lake whitefish, scientists and fishermen found that most are returned to the water alive so there is no significant impact. Lake trout is also threatened and cannot be sold portside, but the amount of this bycatch in the whitefish fishery overall is low. Lake whitefish has a patchy distribution and stocks that intermingle, which makes assessment and management complex. In addition, the Great Lakes span multiple countries and jurisdictions. The Great Lakes Fishery Commission (GLFC) is an international agency covering multiple jurisdictions that coordinates fishery management. Separate lake commissions within the GLFC conduct scientific research and make lake-specific management recommendations. Whitefish scientific research and monitoring in the Great Lakes is highly effective. Complete and robust scientific stock assessments are carried out on a regular basis. Seafood Watch noted that lake trout is a species of concern and it’s unclear when the population will reach management goals for recovery. In general, however, recent Seafood Watch reports found lake whitefish management to be effective.